Oliphant Studio's work can be see behind some of the most famous faces and top-flight models on magazine covers for Vogue, Rolling Stone, Harper's Bazaar, Elle, GQ, Newsweek, and The New York Times, in advertising for Victoria's Secret, Anthropologie, The Gap, Aveda, Lancome, J Crew, and Guess, and painted backdrops and runways for designers like Marc Jacobs, Oscar de la Renta, Donna Karan, Ralph Lauren, Tommy Hilfiger. The studio has an inventory of about 2,000 canvases as large as 12' x 24' and muslin backdrops even larger available for rental from their Brooklyn, NY studio. 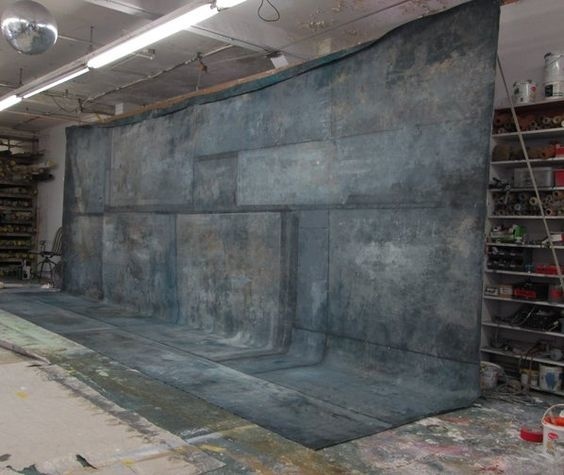 A freshly painted canvas backdrop hanging in the painter's studio with numerous cans and colors of paint behind. Photo courtesy of Oliphant Studio. 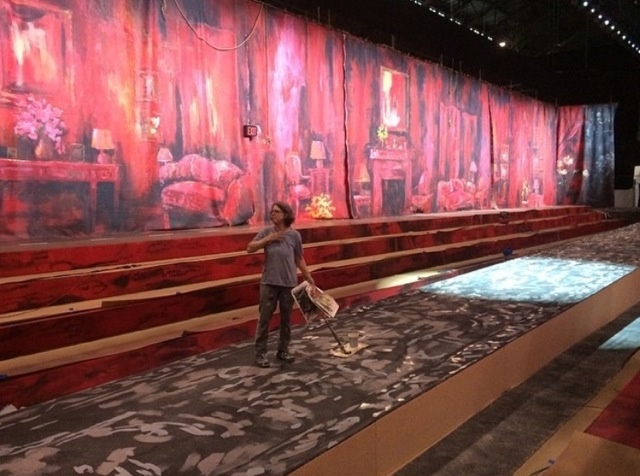 Those lucky enough to visit the studio are generally surprised to find that the large scale backdrops begin life as fabric tacked to the floor with the artist walking over them applying paint with implements from paintbrushes affixed to 3' extensions, to garden watering cans, to bristle brooms to create detailed realistic scenes or swirling abstract textures. The pallet of colors for a composition is contained in a series of buckets rather than dabs on a traditional slab of wood. Oliphant and her assistants paint, pour, and spray colors onto fabric with the swagger of sign painters but with precision of a pointillist. Those skills serve her well working with photographers creating backdrops both working with them on unique collaborations and anticipating trends creating her stock of rental canvas and muslin paintings. "It is all about communication. I am solving my client’s artistic problem and the more information I get from that client, the more successful I will be at solving the problem," Oliphant says. "After all these years of working, of communicating with so many different photographers, designers, producers. I can cut to the chase quite quickly now." 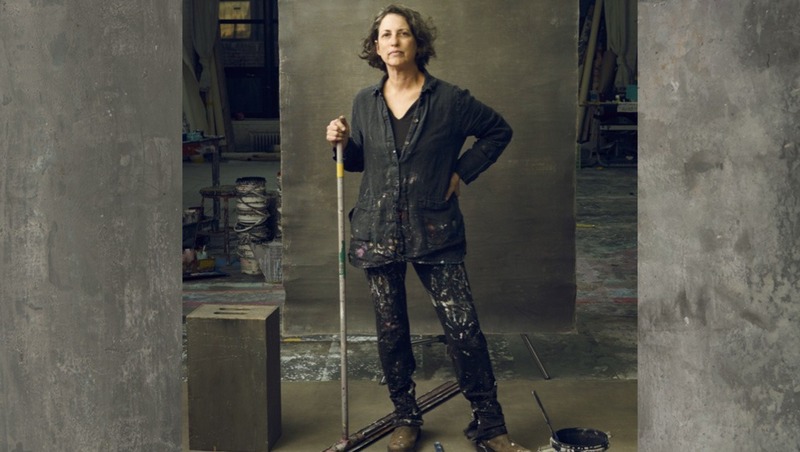 Sometimes known for her richly painted and smoothly textured canvases, her backdrops frequently appear in fashion and portrait images by long time client and collaborator Leibovitz and other photographers who occasionally frame images to include the edges and roll of a backdrop within the composition. The studio's rental inventory also includes numerous detailed scenics, cityscapes, skies, interiors, and specialty creations. Set designers and art directors frequently use the studio's website which displays the inventory when designing sets or creating a concept for a shoot. "For commissioning custom backdrops, we work closely with each client to ensure the backdrop is a collaboration. Each custom backdrop is painted as a unique piece, based on our client’s needs. We can paint anything from a chevron floor or scenic forest to a classic grey portrait drop," says studio manager Munmun O'Neill, who is also Sarah's oldest daughter. Black and white painted chevrons serve as hypnotic floor for this fashion photograph by Horst Diekgerdes. 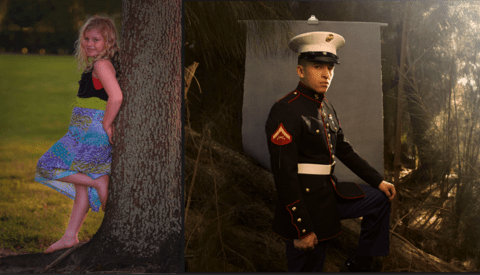 "I have had some incredible experiences painting for photographers that know what they want but aren’t afraid to experiment in the process of getting there. Sometimes you have to just go for it using crazy techniques and unusual materials," Oliphant says. Like other artists, the painter is less comfortable isolating what the current trends are for backdrops in terms of color or style. "This is a difficult question to answer. Yes, there are trends and color palettes that are popular, and we see that in the jobs we are asked to do. The success of a painted backdrop has a lot to do with an artistic aesthetic which is often ineffable and timeless." 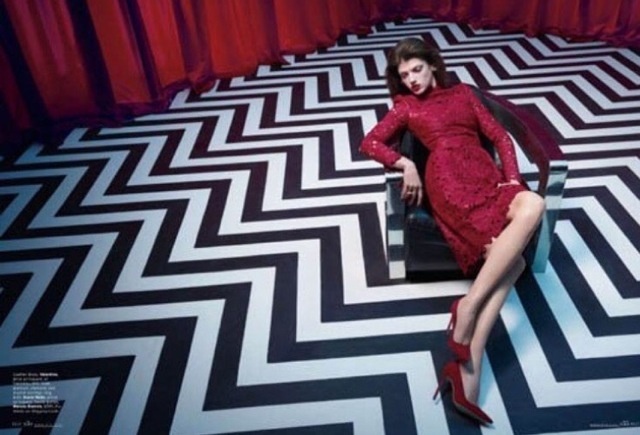 "The largest backdrops we have painted were probably for the Marc Jacobs 2015 Runway show. They were painted to resemble Diane Vreeland’s living room, and had a beautiful luxurious quality to them," says O'Neill. Oliphant got her start painting large theatrical sets before turning her attention to photographic backdrops and enjoys working on a mammoth scale. "Working as a scenic artist in the theater trained me to work large scale to and paint with confidence under great deadlines. I have a great time collaborating on huge projects. Fashion Week is very exciting for us. I love the feeling of looming catastrophe, then everyone coming together to pull it off," she says. Artist and painter Sarah Oliphant on the set of the 2015 Marc Jacob's fashion show. Oliphant frequently paints by standing on top of her canvas using brushes with 3' handles. The larger the project, the larger the piece of fabric needed to paint. O'Neill couldn't estimate how much canvas and muslin the studio goes through each year, but added, "We have Rosebrand on speed dial!" Many of the canvas backdrops are rolled on 10' or 12' tubes and can measure over 20' long to provide both a wall and a floor for a sweeping photographic background. Painted canvas backgrounds can be quite heavy. A 12'x20' backdrop can easily weigh more than 40lbs and require sturdy support to hang for use. Muslin backdrops are lighter weight and more flexible and can be stuffed into bags. My first encounter with Sarah and Oliphant Studio was as a next door neighbor when we both housed our studios on 20th Street in the Flatiron neighborhood of Manhattan, which was formerly known as the Photo District. Among the many eccentricities of having a studio in New York City is sharing a freight elevator which in our case was located inside Oliphant Studio. On numerous times I found myself tip-toeing along the edge of a freshly painted backdrop making my way to or from the freight elevator. The studio itself was a combination of a painting space for the large scale canvases, muslins, and other materials while at the same time being the storage space for Oliphant's incredible inventory of rental backgrounds. I enjoyed the unique privilege of having almost immediate access to Oliphant backdrops for my shoots, for a rental fee, when the need arose as well as having a frequent peek into the creative chaos that goes into painting the industry's leading backdrops. Oliphant Studios welcomes all creative professionals who appreciate working with hand painted backgrounds and scenic art for photos and videos. "We work with most photographers. Whether you are just starting out, or already very well established, you will receive the same treatment at our studio," O'Neill says for background rentals and custom commissions. The variety of backgrounds available for rental can be seen on their website along with fees (including student discounts) and shipping information. Sarah Oliphant portrait photo by Felix Kunze from a series of images shot behind the scenes at Oliphant Studio which can be seen at: Felix Kunze. Wow, I never even considered the backdrops were painted. Thanks for sharing! I have several backdrops from them and they are each UNIQUE and AMAZING to shoot with...Clients are always in awe at how beautiful they are! I LOVE working with this group of women!! They are all phenomenal!! I highly recommend, they are worth every penny. 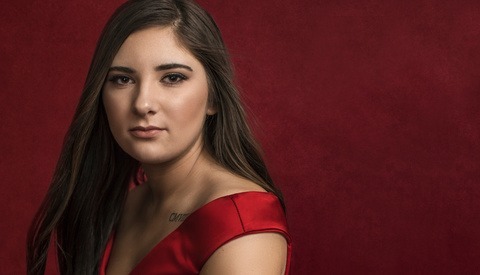 Am I able to order these backdrops instead of renting it from Oliphant Studio? Please feel free to contact them directly for sales, however, they do not have a stockpile of backdrops for sale. They work with photographers to create custom backgrounds for individual photographers to suit their needs. They are priced according to size. Awesome article. One of the best so far on Fstoppers. Some of there backdrops are exquisite and beautiful. I first learned about them from a young Chinese photographer who uses them for her backdrops. My goal is to get one soon!